HEKATEROS (Hecaterus) was the demi-god (daimon) of the hekateris--a rustic dance of quickly moving hands--and perhaps also of the skill of hands in general. He was the father of ten children by a daughter of the first man Phoroneus--the five Daktyloi (Dactys) "Fingers" and the five Hekaterides "Moving Hands." His daughters were the mothers of the Kouretes (Curetes), Satyroi (Satyrs) and Oreiades (Oread Nymphs). "But of them [the daughters of Hekateros (Hecaterus)] were born the divine Oreias Nymphai (Oread Nymphs) and the tribe of worthless, helpless Satyroi (Satyrs), and the divine Kouretes (Curetes), sportive dancers." "Hesiod says that five daughters were born to Hekateros (Hecaterus) and the daughter of Phoroneus, ‘from whom sprang the mountain-ranging Nymphai (Nymphs), goddesses, and the breed of Satyroi (Satyrs), creatures worthless and unfit for work, and also the Kouretes (Curetes), sportive gods, dancers.’"
Hekateros' name is derived from the Greek words hekateris--a dance of swiftly moving hands (kheirôn kinesis)--and hekatereô--a dance involving the kicking of the rump with one heel after the other. Hekateros was also a word meaning "each of two" or "with both hands". The name could also mean "the marvellous hundred" from the words heka, "hundred", and teras "marvel". This might refer to the hundred skillful fingers (daktyloi) of his five sons and five daughters (i.e. ten children with ten fingers each). Hekateros was perhaps identified with Seilenos (Silenus), another elderly god of a rustic dance. Both were desribed as grandfathers of the Oreads and Satyrs. 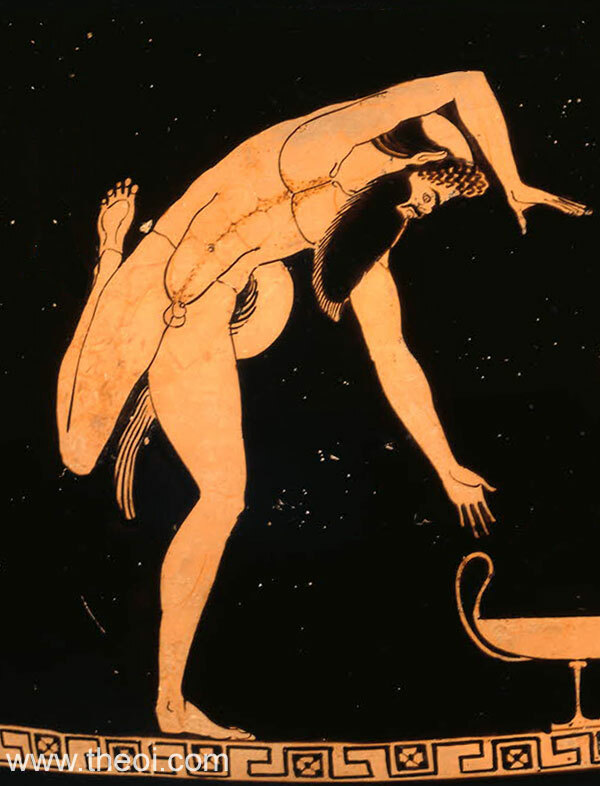 Hekateros also appears to be related to the dancing Kourete (Curete) Pyrrhikhos and the kentauros Kheiron (Chiron)--hekateris and kheiron kinesis were two names for the same rustic dance. Hesiod, Fragments - Greek Epic C8th - 7th B.C.